Four-star prospect by Rivals, 247Sports and ESPN … Ranked No. 20 in the nation at the safety position by Rivals … Rated 29th overall in the state of Texas according to 247Sports … Four-year varsity letterwinner at Mansfield Legacy High School in Mansfield, Texas … Also lettered in basketball and baseball … Played in one game as a senior before an injury forced him to miss the rest of the season … A key member on both sides of the ball for the Broncos in 2017, starting at safety and quarterback for Legacy HS as a junior … Racked up 101 tackles, including 70 solo, with six for loss … Also had three interceptions, six forced fumbles and six fumble recoveries on the defensive side of the field … Passed the 1,000-yard threshold both through the air and on the ground at the helm of the Bronco offense, throwing for 1,122 yards and 15 touchdowns while rushing for 1,064 yards and 13 scores … Led Legacy to the 2017 Texas High School Football Class 5A-II state semifinals and a 12-3 overall record … Earned four 2017 Defensive Player of the Year honors from SportsDay, The Fort Worth Star Telegram, Associated Press and District 10-5A … Credited with 183 total tackles, 139 solo, as a sophomore in 2016, posting seven for loss with nine interceptions, three forced fumbles and one fumble recovery … Joins Mansfield Legacy teammates Taurean Carter and Enoch Jackson Jr., who signed with the Razorbacks in December … CHOSE ARKANSAS OVER: Alabama, Florida, Missouri, Oklahoma, Ohio State, TCU, Texas, Texas Tech, Wisconsin and others. 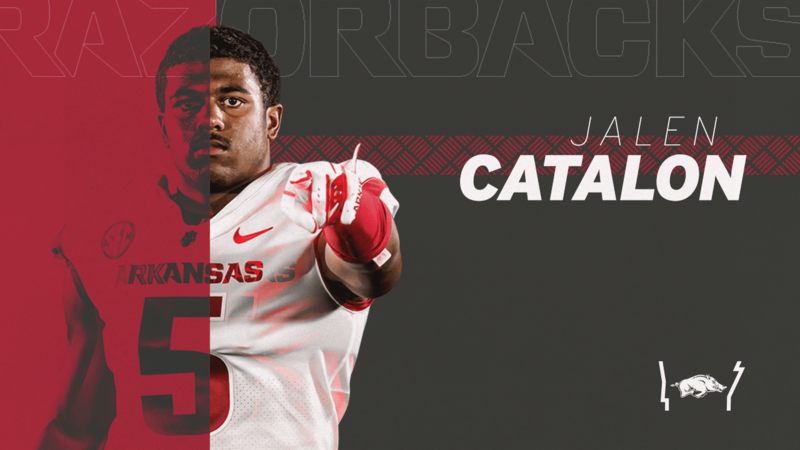 Jalen Catalon … Born March 15, 2001 … Son of Phyllis and Sherman Catalon.